I have been making to-do lists since college. In terms of physical systems, I started with the Seven Star Diary, graduated to a Day-Timer, and then landed on the Franklin Planner. At the time, it was state of the art. After reading David Allen’s book, Getting Things Done, I decided to go digital. I did almost everything in Microsoft Outlook and then, after switching to a Mac, Microsoft Entourage. But ultimately, I switched to Nozbe, which I have been using since 2007. As you probably know, there are hundreds if not thousands of task management apps on the market. I have tried many of the most popular including Asana, Basecamp, Daylite, Flow, Nirvana, Omni Focus, Remember the Milk, Things, Toodledo, Trello, Workflowy, Wunderlist, and ZenDone. 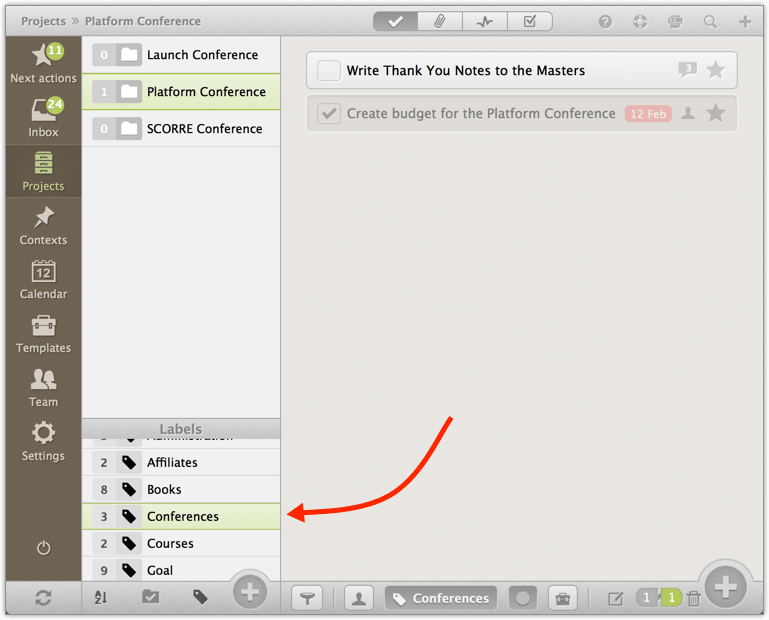 I even tried using Evernote for task management. And though I love it as a digital file cabinet, I don’t think it’s the right tool for the job. (Yes, I even tried The Secret Weapon.) 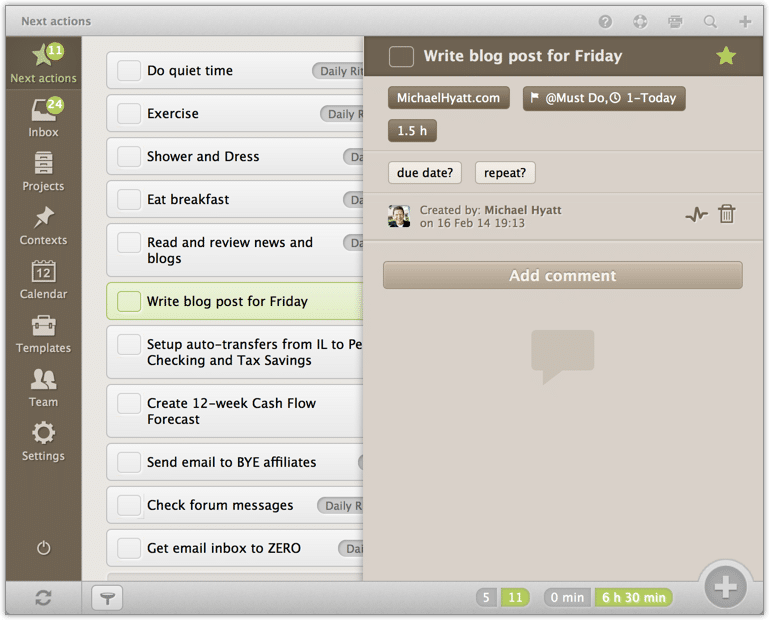 I always come back to Nozbe, which, by the way, includes Evernote and Dropbox integration. Regardless of the tool you use, the process is pretty much the same. Whether you use a paper journal or the latest high-tech app, it pretty much boils down to mastering a set of five practices. 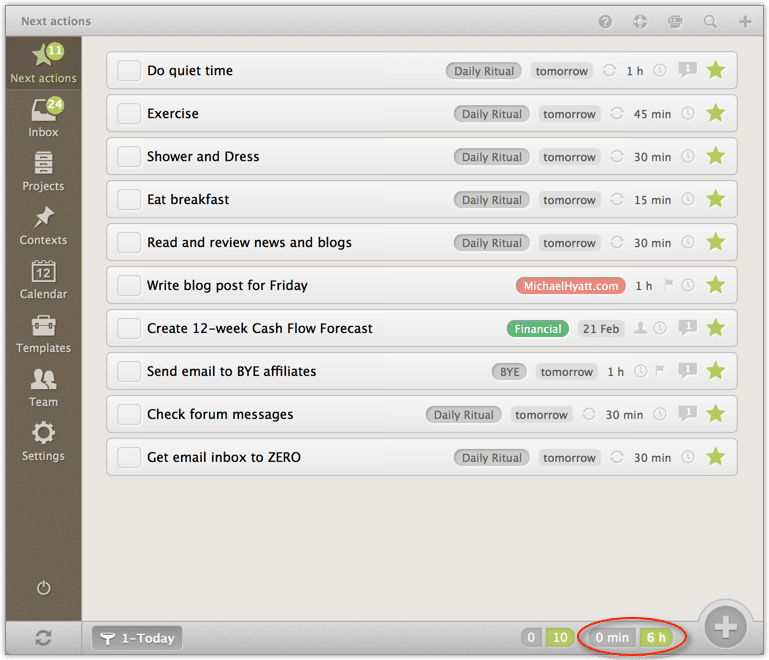 Use these consistently, and you will become a task management ninja. Maintaining a set of master task lists. I set up one list for each project. I also have a list for my Daily Ritual and each of my goals. I even have a Miscellaneous list for items that don’t fit anywhere else.Most projects are private, but I can also share them as needed with my teammates. I used to use Basecamp for this, but Nozbe has recently enhanced this ability, so we are now migrating everything there.In Nozbe, I group projects that go together with Labels. This enables me to maintain a sort of hierarchy with the lists. That way I can, for example, view all my conference projects together. Creating tasks as needed. I create tasks on the fly as I process email, sit through meetings, talk with my family and colleagues, and glean insights from various forms of media. With Nozbe, I can do this with a single, user-defined keystroke. (I use Shift-Control-Command-T.)I always start my task with a verb to insure that it is actionable. I then add a project tag, even if it’s just Miscellaneous, and a quick time estimate of how long I think the task will take. (More about why in a moment. )I occasionally add a context to batch similar tasks together (e.g., @Errands or @Home), but I don’t find these as useful as strict David Allen practitioners do. I also add a due date if it is a time-sensitive task that must be completed by a specific date. Reviewing your lists on a regular basis. 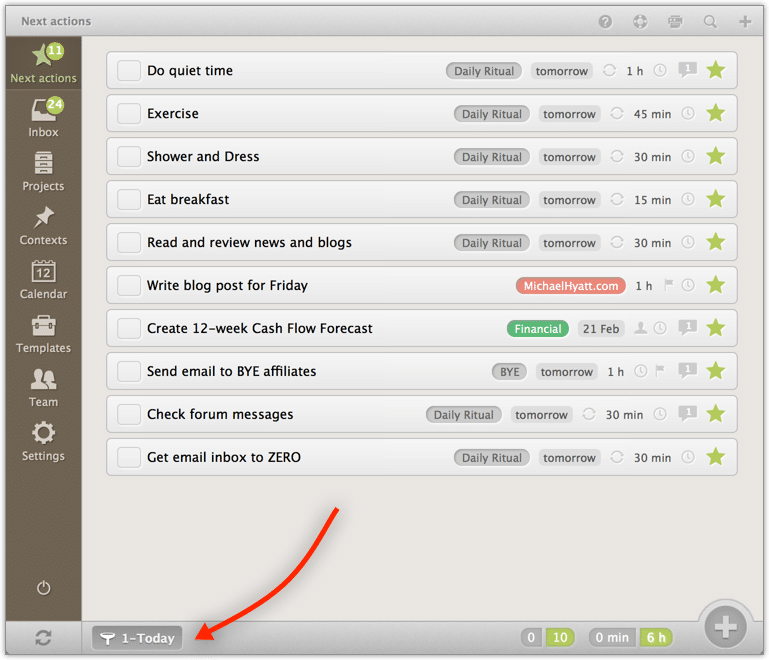 This is the key to successful task management. It’s great to get tasks out of your head and into a trusted collection system. But if you never review it, it’s useless.I have found that it works best to have a review system, so nothing falls through the cracks. I employ a pattern of weekly and daily reviews. I do the weekly review on Sunday nights and my daily review at the end of each day.In my weekly review, I identify the tasks I want to complete in the next week. I flag them with a “This Week” context tag. In my daily review, I identify the tasks I want to complete tomorrow. I flag those with a “Today” tag. Creating a Today list for each day. Before I begin my day, I want a list of the tasks that need to be done. Usually, I have completed this the night before, so I simply review the list and add anything that didn’t occur to me then.As I look at this list, I add a “@MustDo” context tag to the one to three tasks that absolutely must be completed today. (I don’t include my Daily Ritual tasks, because I assume I will do those no matter what. )Once I have the list, I arrange it sequentially in the order I intend to tackle it. With Nozbe I can simply drag and drop the items. I always start with my Morning Ritual, then begin working on my most important task first, when my energy level is at its highest. When that is complete, I move to the next most important task.This is where the time estimate I assigned earlier comes in handy. Nozbe keeps a running total of the time it will take to complete all the tasks on a given list. I try never to schedule more than six hours worth of work a day. The reason for this is I consistently underestimate how long things take, and I want to allow some margin in my day. Tracking tasks you delegate to others. In a perfect world with perfect people, you would delegate a task and forget about it. But, unfortunately, that’s not the world we live in. Most people are overcommitted—even good people—and things occasionally fall through the cracks.When I want to delegate a task, I enter it into Nozbe just as I would any other task. Then I add a context with their name preceded by the caret symbol, so these tags sort together (e.g., ^James, ^Megan, or ^Raquel). This way, I can simply click on that context to see what I have delegated to that person.But Nozbe actually goes one step further. It provides the ability to share projects and tasks with others, even if the other person is not a Nozbe user (as of version 1.9). 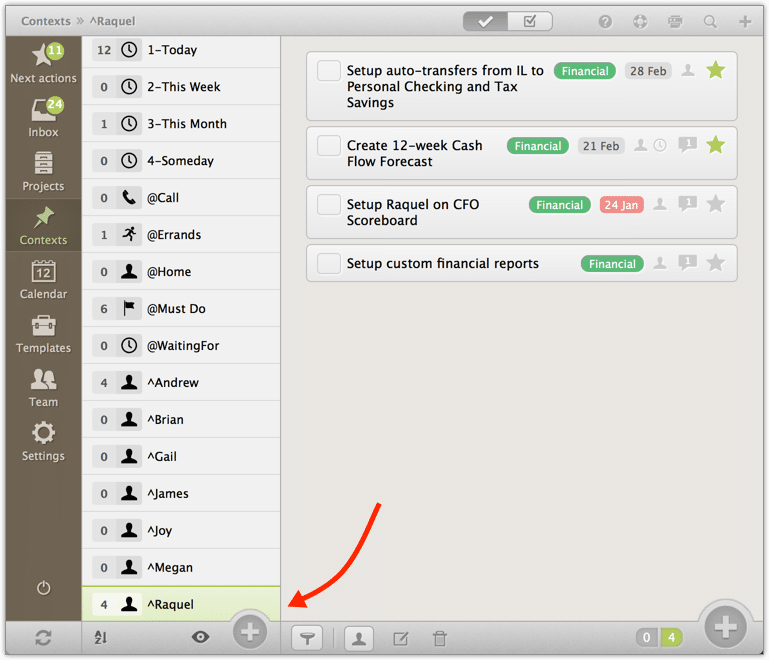 I am just beginning to explore this feature but intend to rollout it out to my team in the weeks ahead. People often try to make task management more complicated than necessary. Yes, you probably need a sophisticated project management system for building a nuclear submarine or renovating a house. But short of that, you just need to become proficient at consistently using these five practices. It’s amazing how much you can get done if you master these. Question: What task management practices do you need to implement?